One of the world's finest collections of material by and about Sir Arthur Conan Doyle available to the public. To honour the author and his works, the Toronto Reference Library established the Arthur Conan Doyle Collection, which has grown into one of the world's finest collections of material by and about Sir Arthur Conan Doyle available to the public. With the completion of major renovations in 2014, the Collection is now housed within the Marilyn & Charles Baillie Special Collections Centre on the 5th floor of the Toronto Reference Library, which brings the Reference Library's Special Collections together in one place. 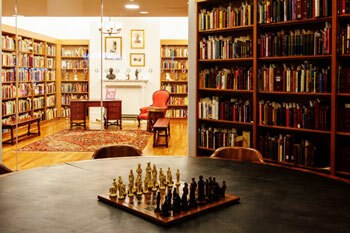 The Collection lives in two adjacent spaces: a large L-shaped section of shelving in the spectacular two-storey rotunda of the Special Collections Centre, and an adjoining glass-fronted room ( known in the Library as "Room 221B") furnished in Victorian style -- a comfortable place replete with evidence of Sherlock Holmes' presence. The room delights aficionados and novices alike, and those uninitiated in Sherlockian pleasure may find it difficult not to become enthusiasts when they see these enchanting artifacts in such authentic surroundings. As well as material by Conan Doyle himself, there are numerous critical works, including the serious and not-so-serious writings of Sherlockian scholars: "the writings on the writings". Not limited to books alone, the Collection includes a number of original Sherlockian illustrations by noted artists such as Sidney Paget and Frederic Dorr Steele, who illustrated some of the first appearances in print of the Holmes stories. Add to this an assortment of films, audio tapes, theatre programs, posters, individual issues of non-Doylean publications containing Doylean material and other materials, and you have an extensive, eclectic portrait of the impact of Sir Arthur Conan Doyle's life and work on the world's art and culture. The Collection is open during regular Toronto Reference Library opening hours, providing ample opportunity for students, artists and historians to explore, uncover and rediscover the joys of Sir Arthur Conan Doyle, his life and works. Or visit Library's web page about it here. The Collection was born in 1969 with the purchase of over 200 volumes, part of the estate of Toronto collector, Arthur Baillie, and a lot of over 1500 items from Harold Mortlake of London, England. In 1970, the Library acquired an extensive collection of Sherlockian ephemera from Toronto collector Judge S. Tupper Bigelow and over 200 editions of The Sign of the Four from American collector Nathan L. Bengis. Over the years the Collection has grown with purchases and donations of many items, including numerous editions of Conan Doyle's Sherlockian and other published works, several of Conan Doyle's letters and notebooks, a copy of Beeton's Christmas Annual for 1887, which contains the first appearance of Sherlock Holmes in print, and the manuscripts of Conan Doyle's short story "The Marriage of the Brigadier", the plays, Angels of Darkness (which had never been performed or published) and The Crown Diamond. The Reference Library was extensively renovated over several years, ending in 2014. This resulted in the creation of a completely new Arthur Conan Doyle Room, part of the new Marilyn & Charles Baillie Special Collections Centre on the 5th floor of the Library, bringing the Reference Library's Special Collections together in one place. To celebrate the new centre, the Friends published The Four Pillars : the foundations of the Arthur Conan Doyle Collection, Toronto Reference Library, the story of the four private collections the Library acquired in 1969 to form the basis of the Collection. It was published in a limited edition of 100 numbered and 20 unnumbered copies, which almost immediately sold out. Rather than reprint the paper version, we have given the Library our consent to publish it as an e-book on the Library's website here. One of the leaders in the founding, growth and success of the Collection was Cameron Hollyer, its first Curator. Cameron was an enthusiastic Sherlockian and an expert Doylean, equally at home playing the Great Game or curating the Collection. Over the years every major Conan Doyle and Sherlock Holmes scholar or bibliographer came to visit the Collection and learned first-hand just how valuable a resource Cameron could be. It was impossible not to be charmed by his gentle, brilliant humour. 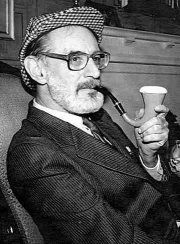 Cameron retired as Curator in June, 1991 and continued to work in the Collection and attend Sherlockian events until his untimely death on June 4, 2000. Cameron was an important part of the Friends group from the very beginning and he continued to contribute his knowledge and skills to the group after his retirement. We greatly miss his support and friendship. In his memory, the Friends have established the annual Cameron Hollyer Memorial Lecture. See here for more information about this event. 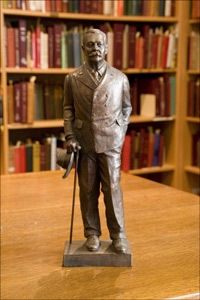 Gifts to the Arthur Conan Doyle Collection Friends Acquisition Fund in Cameron's memory would be very much appreciated.